In Maryland the weather changes in the blink of an eye so be prepared for all the elements with a screened-in porch. Protect your furniture from precipitation and protect your food from the annoying summer bugs. 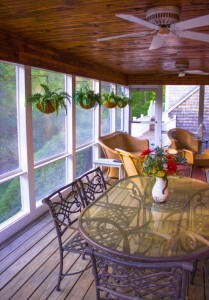 There are numerous benefits to a screened-in porch and here are a few. Best of both worlds. A screened-in porch brings the outdoors in, but without all the hassles that come with being outside—namely the bugs. Breathing in fresh air and getting outdoors is great, but sometimes the insects are not worth the gains. Especially in the Maryland summer, mosquitos can be brutal so a screened-in porch offers a happy medium. Perfect for entertainment. Sitting outside is the perfect place to entertain family and friends no matter the season. Play a game, catch up on the latest gossip, or chow down on your favorite snacks on your screened-in porch. Catch up on “me” time. Your screened-in porch is the perfect place to relax. If you love reading or even napping outdoors, a screened-in porch is the ideal option to avoid bug bites and sunburn at the same time. Increase your home value. A screened-in porch can add a lot of value to your home, which is always a major benefit to any home improvement project—especially one like this that also builds curb appeal. Keep your family safe and active. No matter the weather, your kids are safe playing in your screened-in porch. On rainy days, a screened-in porch is the perfect alternative to just being cooped up in the house all day. We all know the drill in Maryland. One minute the sun is shining and the next storm clouds roll in and your beautiful sunny Maryland day is over. In order to be prepared for it all, a screened-in porch is the way to go. Ready to talk to someone about a screened-in porch? Contact Mid Atlantic Deck and Fence today for a quote or more information about a screened-in porch or to find a contractor that’s right for you. Mid-Atlantic Deck and Fence has been building custom fences and decks throughout Maryland since 1987. Today, we are one of Maryland’s leading and most innovative deck and fence companies. We invite you to follow us on Facebook and Twitter.